Each time I write a Fresh from the Market product post, I'll follow that post with a recipe I've tested. In my profile of Bosc pears, I wrote that this elegant fruit holds its shape no matter what you do to it (barring pureeing it). And as luck would have it, we bought a wonderful cookbook this weekend that contained the perfect recipe for our pears. On Saturday, we subwayed to the Upper East Side's Kitchen Arts and Letters, a one stop shop for out-of-print and current food books: novels, memoirs, how to's, and cookbooks. We left with two bags worth of new books, including This Organic Life, The River Cottage Preserves Handbook, and Good Food. I've spent a large portion of every night since Saturday flipping through and reading Good Food. I have to admit, I love everything about the book: its cover picture, type choices, creative table of contents, photography, recipe choices, and style of writing. I'm even intrigued by the cover's material (a softish hardback feel). Good Food was written by Neil Perry, a prominent Australian chef with three restaurants in Sydney and one in Melbourne. Good Food focuses on simple ingredients packed with flavor. The book contains multiple vegetarian and fish recipes. Each recipe includes a thoughtful and personal introduction detailing why the recipe was chosen for the book and additional ways to serve it. Scattered throughout Good Food are pictures of Perry and his daughter, whom he "knows one day will enjoy vegetables". The book ends with several impassioned, though not preachy, thoughts on children and healthy food. As Chef Perry says, "Teach children that cooking is fun, show them how to eat and prepare fresh food, and them to understand good taste." The back of the cookbook has quick side dishes and sauces to liven up any meal." 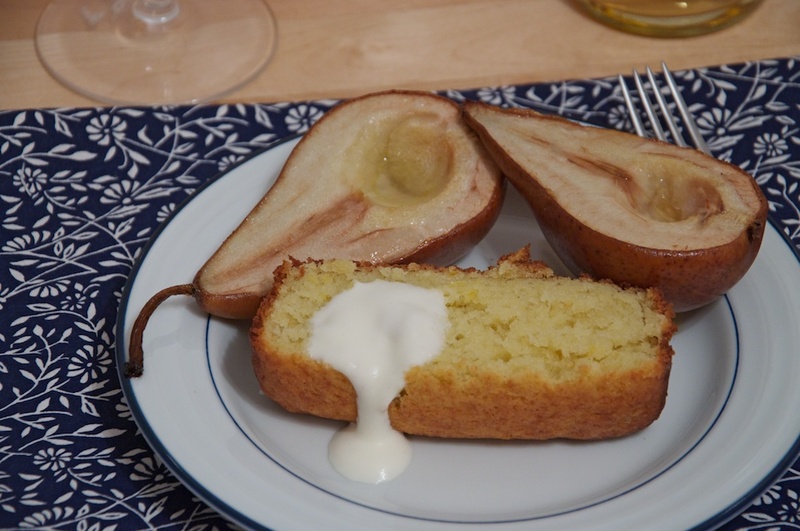 Our Bosc pears were certainly livened up by his recipe for Olive Oil and Sauternes Cake with Roast Pears. My version used Chateau St Michel's Sauternes. When I went to the wine store I discovered that most bottles sell for $125! (*I'm assuming that's not the case in Australia.) I still used Sauternes, just a slightly cheaper version. The cake and pears bake and roast at the same time in the oven. Each component uses the wine, making for a supremely sweet ending to our dinner. The olive oil cake was moist on the inside, with a slight hardness to the exterior. The cake has a hint of lemon before dissolving in your mouth. After 45 minutes of roasting, the pears are partially caramelized and packed with flavor. The syrup is an added bonus, though in this case, take it or leave it--the rest of the dish is rich enough to omit it. This is one of the easiest cakes I've made and a really quick, satisfying way to eat Bosc pears. Preheat the oven to 350. Place the pears in a roasting tin, drizzle with the wine and oil and sprinkle with the sugar. To make the cake, lightly grease a 4 1/4 x 8 1/2 inch loaf pan. Beat the sugar and eggs together in a large bowl with an electric mixer until pale and creamy. Add the oil, wine, milk, and lemon zest, and beat until combined. Add the combined sifted flour and baking soda and slowly beat until just combined. Pour the mixture into the prepared pan. Bake the cake alongside the pears for 40-45 minutes, or until a tested with a skewer. Allow the cake to cool for 5 minutes before turning it onto a wire rack. Allow the pears to cool to room temperature. To make the syrup, place the sugar and 2 tablespoons of water in a small pan over low heat. Stir until the sugar has completely dissolved. Increase the heat and simmer the syrup until it's golden. Turn off the heat and add the wine. 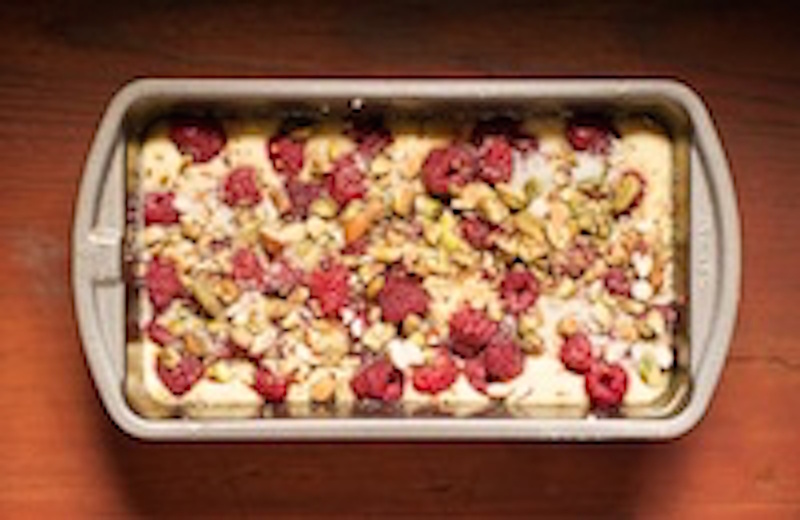 Serve the cake with the pears, drizzle with syrup, and add a dollop of cream. Each day I face a dilemma sometime between the hours of 11:30 and 1:00. Bon Appetit recently published an entire spread on Sqirl, a restaurant in LA that writer Matt Duckor calls “the future of restaurant food”.